Illuminated ignition switch (if equipped) Whenever a door is opened, the ignition switch will be illuminated for your convenience, provided the ignition switch is not in the ON position. The light will go off approximately 10 seconds after closing the door or when the ignition switch is turned on. Ignition switch and anti-theft steering column lock Ignition switch position LOCK The steering wheel locks to protect against theft. The ignition key can be removed only in the LOCK position. 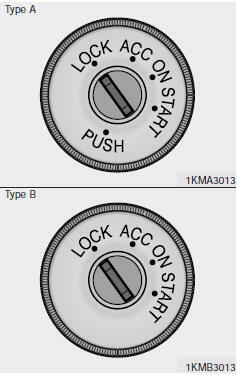 When turning the ignition switch to the LOCK position, push the key inward at the ACC position (Type A) and turn the key toward the LOCK position. ACC (Accessory) The steering wheel is unlocked and electrical accessories are operative. ON The warning lights can be checked before the engine is started. This is the normal running position after the engine is started. Do not leave the ignition switch ON if the engine is not running to prevent battery discharge. START Turn the ignition key to the START position to start the engine. The engine will crank until you release the key; then it returns to the ON position. The brake warning lamp can be checked in this position. NOTICE If difficulty is experienced turning the ignition switch to the ACC position, turn the key while turning the steering wheel right and left to release the tension. WARNING When you intend to park or stop the vehicle with the engine on, be careful not to depress the accelerator pedal for a long period of time. It may overheat the engine or exhaust system and cause fire. WARNING - Ignition key • Never turn the ignition switch to LOCK or ACC while the vehicle is moving. This would result in loss of directional control and braking function, which could cause an immediate accident. • Before leaving the driver’s seat, always make sure the shift lever is engaged in 1st gear for manual transaxle or P (Park) for automatic transaxle, set the parking brake fully and shut the engine off. Unexpected and sudden vehicle movement may occur if these precautions are not taken. • Never reach for the ignition switch, or any other controls through the steering wheel while the vehicle is in motion. The presence of your hand or arm in this area could cause a loss of vehicle control, an accident and serious bodily injury or death. • Do not place any movable objects around the driver’s seat as they may move while driving, interfere with the driver and lead to an accident. Automatic transaxle When turning the ignition switch to the LOCK position, the shift lever must be in the P (Park) position.